As employees both desire and feel pressure to expand their digital work and presence, through Facebook, Twitter, DPO, etc., we are fast becoming not just a 24-hour operation, but 24-hour employees. Am I working overtime when I Tweet my stories from home to make sure they get seen? Do supervisors expect us to be at our desk filing breaking news 9 hours a day, and then available to do the same for 12 more hours at home? And as we expand sources of revenue, what are the rights and responsibilities associated with things like e-books and other projets? Will employees share in the new revenue? Are they expected to work on those projects on their own time, or on company time? Do employees have the right to use material generated during work hours to seek personal opportunities in e-books or other formats, if the company is not interested in producing those themselves? This is something the Guild is planning to address during bargaining. In the meantime, let’s get a discussion going. Do you “work Tweet” when you’re off the clock? Do you feel pressure to do so? Or is social media so integrated into your life that there’s no real distinction between your work and personal use of Twitter and Facebook, and that’s fine by you? Sound off below by leaving a comment. This is a very good point and should be brought up in negotiations! Technology is great but I have seen smart phones & pads consume the lives of friends and loved ones to the point that it has hurt their relationships. Yes, if it is related to work then there should be some kind of compensation or it should not be done or expected of any employee to do so. Tomorrow is another day and there is more important things in our lives. I don’t feel pressure to be on social media outside work hours – and it certainly hasn’t been communicated to me that it’s required. My perspective is that it’s up to each person how they handle social media once they step outside The Post’s doors. And our social media obligations can be met within work hours. Let’s say you have a weekend story you’d like to promote – you come in Monday morning and post an ICYMI message. This can be beneficial because it gives exposure to something beyond its first cycle online . I am on Twitter outside work hours because it has become my No. 1 source for news and information. I consume news all the time, whether on the clock or not. Most journalists do. Only now it is more interactive – and the circle is larger. A decade ago, I would have gone out to the front porch, picked up my (two) newspapers, and maybe discussed the news with friends and neighbors. Now I do the same on Twitter – only I have 2,000 contacts. Social media also benefits me professionally. 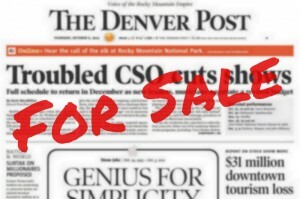 People on Twitter and Facebook are following me – not The Denver Post. So posting to social media is mutually beneficial. On e-books … I too would like answers to those questions. The Tebow/Broncos project makes it clear this is something The Post sees as part of the business moving forward. No tweeting for work should be done off the clock. It’s difficult enough to separate your work and personal schedule sometimes, without melding social media.